This prize draw has now finished. The winner was Kristen Fischer. I want to win it. I dont have twitter. But I like all of Stings songs, and The Police songs. My research on the net gave the following opinion: "Demolition Man" is a very mediocre Police song, but the song still has power Why Sting a song for the soundtrack of such a film contributes, may remain a mystery. My opinion: the song is under the title: Back to the bass totaly right! It is succeeded. Thats awesome........ what a GREAT PRIZE!!!!!!! Someones going to be very happy!!! My dear Sting. The next 2 October is my birthday too( 4o years). My only dream is to meet you, but I can´t travel to NY; it´s so far and so expensive...PLEASE, ANSWER ME! One word, and I will have the best present of my life. Everybody thinks it´s impossible. I´m a dreamer, but in the one minute of Granada´s concert (Spain), you read my banner and you sang for me. I cryed very very happy, because it was my dream. Now I believe in my dreams... Nothing is impossible. I remember sitting at my computer talking to fellow members in the chat room that night commiserating about not being at Irving Plaza. Answer the following trivia question for the chance to win an autographed copy of Sting's album Brand New Day! Released in 1999, the album was written and recorded just before the millennium. 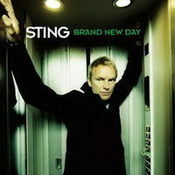 Sting has said that Brand New Day was meant to serve as an optimistic and positive antidote to the fear and pessimism surrounding the Y2K phenomenon.